Pergo on Dricore Subfloor, & a toilet??? I'm (re)finishing a bathroom in my basement. I have a toilet that sits directly on the concrete floor. I'm planning on using the dricore subfloor tiles & Pergo flooring. What's the best way to finish the flooring around the toilet? Can I raise the toilet somehow & let the flooring run underneath as you typically would? I cant see butting both the tiles & flooring to the toilet... that'd look like hell. Personally I would pour leveling mix to build up the thickness and then use these extenders. Extra thick wax gasket with 40% more wax saves using two wax rings for faster installation and a more positive seal. Polyethylene flange. For problem areas that need extra thick wax gasket. Fits 3" or 4" Lines. 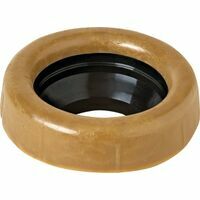 This Extra Thick Toilet Bowl Gasket is one of many top quality items in our Wax Rings department. you should not have to raise it.if need be use 2 wax rings. Raise the flange, doubling rings is asking for trouble. What kind/size of pipe? Those stack rings above will work, better yet would be a insert flange that fits in the old flange/pipe. If you only want to do it once, use ceramic tile and thinset. x2 ........I'd go with the flange entenders (there is many different types to choose from) well before I went with the extra thick wax rings. Pergo and similar products do not fair very well when exposed to water. They are basically just high density particle board which swells and disintegrates when wet. Bathrooms are typically not dry environments. Had a customer whose dishwasher sprung a leak while they were gone overnight and it flooded the kitchen floor. When they came home the next day the Pergo had already swells like a sponge. The leak was only about a gallon of water. Wouldn't use it in that application myself. +1 on the not using laminates in bathrooms especially. If you look on the package it will tell you using in a humid environment voids the warranty. Tile around the toilet use an extension for the drain and longer Tbolts to the flange.